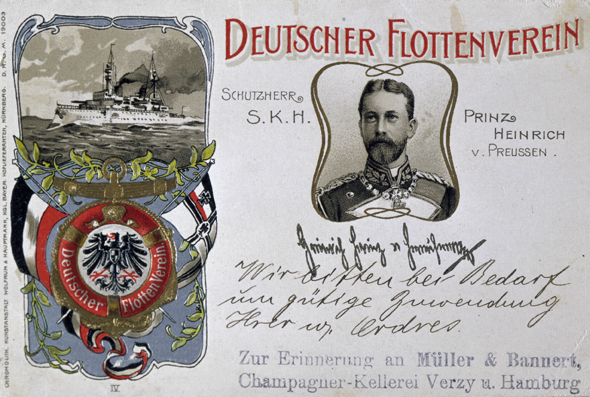 The German government helped fund the German Navy League [Deutscher Flottenverein, DFV], a patriotic society founded in 1898. The league managed to attract over one million members before the First World War. It aimed to mobilize popular sentiment in favor of the German navy and to work on behalf of its expansion. Designed by Hans Rudi Erdt, this 1902 postcard shows Prince Heinrich of Prussia, the patron of the organization. The handwritten note on the card requests a donation to the Navy League.